Microsoft has officially announced and revealed its upcoming Windows 8 Operating System Stock-Keeping Unit's (SKUs), Windows 8 Editions and Windows 8 Versions details on their official windows blog. Microsoft has now limited its Windows SKUs as compare to its previous Operating Systems I.E. Windows 7 and Windows Vista. 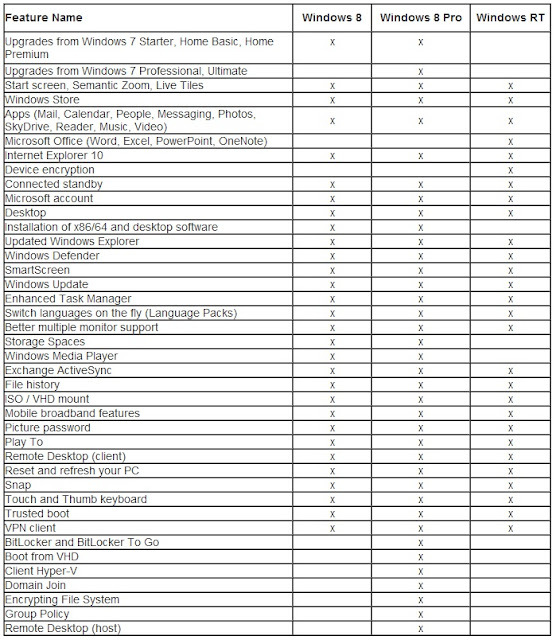 Microsoft Windows 8 will have the total of 3 SKUs Editions (or 5 SKUs if you count Enterprise and China specific editions). Microsoft has break its traditions of introducing way too many Versions, Editions and SKUs of Windows in past. For Windows 7 there were 6 versions to choose from, and the registry files included with the Windows 8 Consumer Preview suggested that was increasing to 9 SKUs for Microsoft’s next OS but now its official that Microsoft Windows 8 will have the total of 3 SKUs Editions only. Microsoft Windows 8 SKUs Versions and Editions include; Windows 8, Windows 8 Pro and Windows RT. Windows RT will be for Windows on Arm devices and will only be available on pre-installed devices. There won’t be 9 versions of Windows 8 OS as they revealed in Windows 8 Consumer Preview few months back, Microsoft has chosen to keep it simple with three primary Windows 8 SKUs (which totally make sense for users). It looks like as though they have listened to feedback from users. In Windows 8 Blog post Microsoft does mention that there will be a Windows 8 SKU for China too; "For China and a small set of select emerging markets, we will offer a local language-only edition of Windows 8." Microsoft will offer only 2 Windows 8 SKU's Editions for sale including Windows 8 and Windows 8 Pro Editions and Windows RT will be for Windows on Arm devices and will only be available on pre-installed devices. Windows RT is exclusively aimed at ARM platforms and therefore needs to be differentiated. It will only ship with hardware and comes with touch-optimized versions of Word, Excel, PowerPoint, and OneNote as standard. Soon after those Windows 8 SKU's Microsoft has also planned to introduce Windows 8 Enterprise Edition for enterprise customers with Software Assurance agreements. According to Microsoft; Windows 8 Enterprise includes all the features of Windows 8 Pro plus for IT organization that enable PC management and deployment, advanced security, virtualization, new mobility scenarios, and much more. Windows 8 SKU's Editions and Versions will be offered in 32-bit and 64-bit versions from Microsoft. 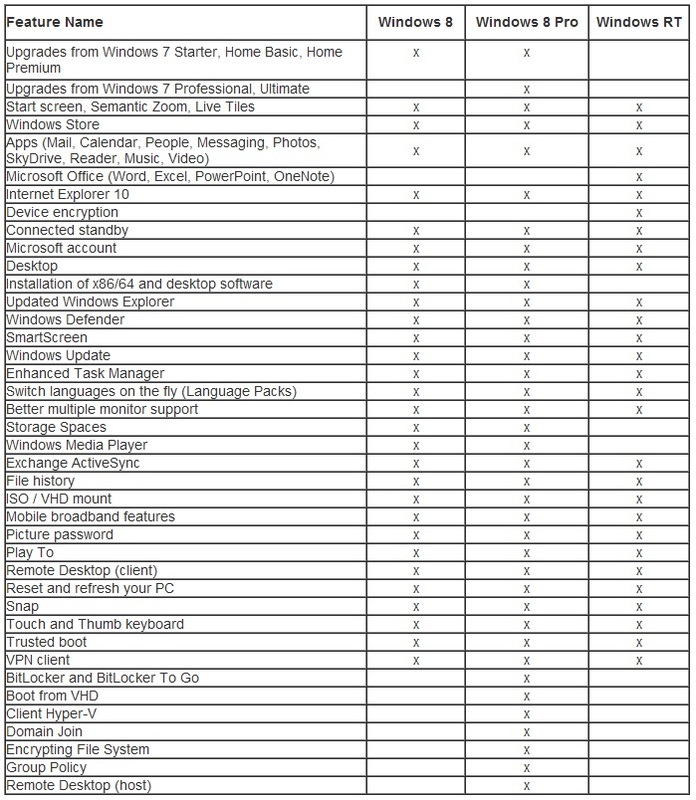 Let’s find out the Comparison, Differences and Key Features of Windows 8 SKU's by Editions breaks down below in chart. To find out more on Windows 8 SKU's Click here.